Hello and happy Sunday! Hope you get some stamping done today! Image printed on Georgia Pacific white 110lb cardstock from Walmart, I colored it using Copics and Prismacolor markers. I really need to watch a few more tutorials on how to do it and practise practise practise. Ok, and buy more copics! I made the sentiment on the computer. Thanks so much for stopping by my blog today! Recipe and inspiration piece for the cupcake craft challenge is below. Accessories: prisma flowers, rhinestone brad, stickles, word window punch, CM cutting system, nestabilities, big kick, cuttlebug folder, paper piercing tool kit. ah, cute card - love that stamp! Beautiful and your coloring is great! tfs!!! Ellie - I love the bling on the card. I just got into Copics and can totally understand Practice, Practice, Practice. Having said that though - your colouring is great. Susie looks fab and I feel your "practice" with the Copics...although you did a wonderful job! 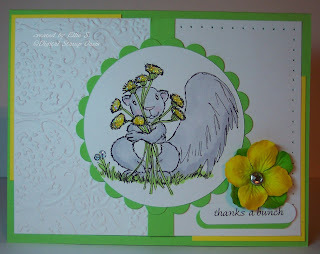 Love the springy feeling of your card! That is co cute! It is so springy and cheerful looking - I like the colors and the layout. cute card! cool inspiration piece. gonna check out this cupcake challenge. i have been out of the loop for a while but this is definitely inspiring :) thanks for sharing! Love it! The squirrel is just ideal for this challenge. Love your bright happy colors too! OK, these squirrels are just too cute! I love watching them play, too. Once I was silly enough to put a squirrel feeder in our yard. My suggestion...DON'T DO IT!!! LOL...they soon took up residence in our crawl space and had a family!!! So cute! I am loving that squirrel! Your coloring looks great to me and your digita image is so cute. Wow!! What a sweet card!! The image is so cute!! 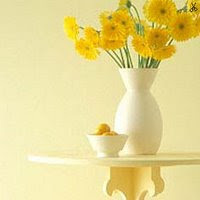 Love your cheery colors!! HI! I saw your post on the New Blog comment Thread on SCS and decided to pay a visit. What a CUTE card! I love coloring Cute images too! What a great idea to start your own digital stamped images using your husbands drawings. He (and you) are so talented! Hi, I back again today, but there is no new post yet. Soooo..here is my second commeng for this post. I saw this challenge on another blog this morning. Love your take on the inspirations photo. Super cute card Ellie!! I love the embossing on the white layer so pretty! Eine tolle Umsetzung der Challenge! Das Motiv gefällt mir richtig gut und die glitzernden Blümchen sind immer ein tolles Highlight. I love this guy :), love how you combined the cb with this. very cute...I like the white panels; one embossed and one not and the scalloped circle over them...pretty!